Welcome to the Express by Holiday Inn Madrid Alcobendas, your best selection to stay in the North of Madrid. Easily accessible through the Motorway A1, the hotel is located close to the Industrial Park of Alcobendas next to the Rio Norte shopping mall and at only 500 meters from the Moraleja Business Park. 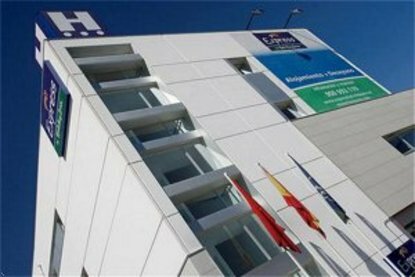 Ideal for business and leisure alike the Express by Holiday Inn Madrid Alcobendas is sited near Telefonica, only 8km from IFEMA Exhibition Centre, 8km from Madrid Barajas Airport and 6km from the new Terminal T4. Public transportation to Madrid city centre is available next to the hotel, (metro La Granja).In the surrounding of the hotel you can find Sport Centres as Jarama Motor racing Circuit and Polideportivo Municipal de Alcobendas also you will enjoy of shopping and leisure centres like Plaza Norte, Ikea, Diversia and Moraleja Green where you can relax playing Golf. The hotel is also well located from the new Hospital Infanta Sofia.The Express by Holiday Inn Madrid Alcobendas features 109 air conditioned rooms with High Speed Internet Access and WIFI connectivity in all hotel areas at a charge. Complimentary buffet breakfast is included in the rate. Stay with us and enjoy our Stay Smart spirit and ambience and make your stay a memorable one.